Many people feel that a house isn’t really a “home” without a four-legged, furry friend. Companionship of a pet has been shown to build self-esteem in the elderly, increase cognitive alertness, and lift the spirits of people with Alzheimer’s. Often times, an animal can reach a person in a way that other people cannot. Researchers have found that elderly individuals, who own a pet, visit the doctor less often than those without an animal companion. By giving an individual a sense of purpose and the responsibility for another life, pet owners seem better able to cope by themselves. Research found that the elderly without pets went to the doctor 16% more often. Pet owners visit the doctor less often with minor problems due to an overall sense of well-being and happiness. A beloved animal can reduce depression and loneliness with unconditional love and acceptance for their owner. 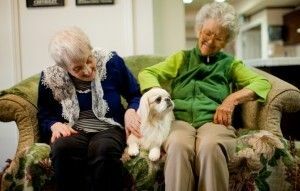 Pets can also help the elderly connect with other people. Social interaction is vital to the health of a senior citizen. Many people will stop to pet a dog or ask a neighbor about their cat, who might not otherwise reach out to them. Any animal from the pound may find themselves in paradise with an aging companion with lots of love to give. But if you are considering a pet for your parent or loved one, make sure to carefully think about the temperament and age of a potential pet. A young puppy or kitten may be too high energy for a senior citizen with physical limitations. Food, litter, toys and vet visits can be a financial demand on a fixed budget. If your loved one can no longer drive, would they be able to get a new pet to regular vet appointments or to a groomer? A pet can be a great benefit, if it brings happiness and is not a burden. If you own a well-behaved dog or mellow pet, it might be a good opportunity to bring your pet to your loved one’s home or assisted living community for a visit. A visiting pet can bring so much joy, laughter, cuddles, and licks. Animals can help to normalize an environment and make others at ease too. A pet can spark great memories for many residents and brighten their day. The power of a pet can be physically, psychologically and socially beneficial for your aging loved one. If they have a pet, make sure they can sufficiently care for their own needs and those of their pet. If they don’t have a pet, would this be something that would add to their happiness and well-being? Whatever your specific situation might be, don’t underestimate the power that a furry, four-legged companion can have on your parent or aging loved one. Many residents are in assisted living with pets, including Aegis Living residents. They bring unconditional love and joy to all of our residents, staff and families.